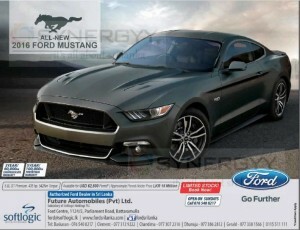 Future Automobiles (Pvt) Ltd is an subsidiary of Softlogic Holding PLC announces they have Imported all New Ford Mustang 2016 SUV for Rs. 15 Million for Permit Holders (with Available Permit of USD 62,500). Ford Mustang well known for their performance and pleasure of driving, now you can enjoy Ford Mustang 2016 version in srilanka with 5.0L GT Premium engine with 435hp, 542Nm Torque. For more details see below image or visit Toyota Lanka (Pvt) Ltd.
Prestige Automobile (Pvt) Ltd an authorized dealer of BMW automobiles in Sri Lanka offer an attractive prices for your dream ultimate driving pleasure car BMW 3 Series car for Rs. 7.2 Million for Permit Holders. 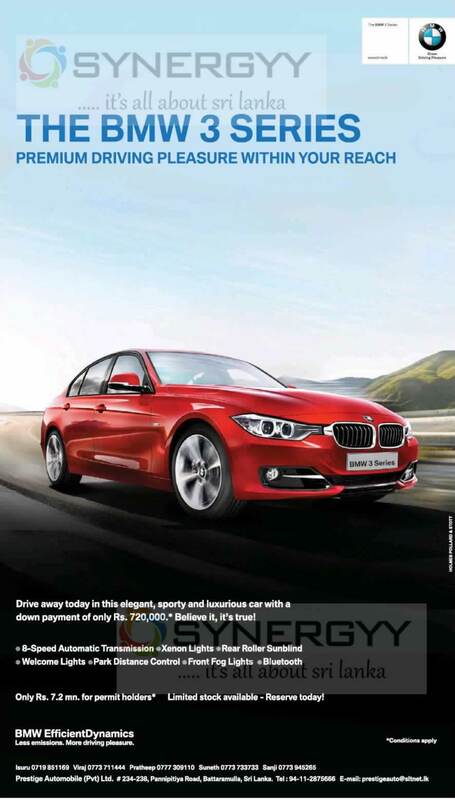 Drive away today in this elegant, sporty and luxurious car with a down payment of only Rs. 720,000. * Believe it, it’s true! Limited stock available – Reserve today! 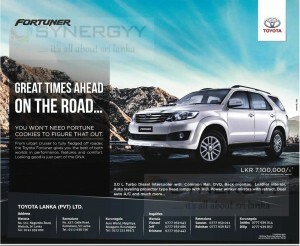 From urban cruiser to fully fledge off roader, the Toyota Fortuner gives you the best of both worlds in performance, features and comfort. Looking good is just part of the DNA. A fresh new design concept, loads of power under the hood and the largest space in its class – that’s the award-winning Hyundai Santa Fe 2014. Now available for permit holder for USS 20,700 upwards. 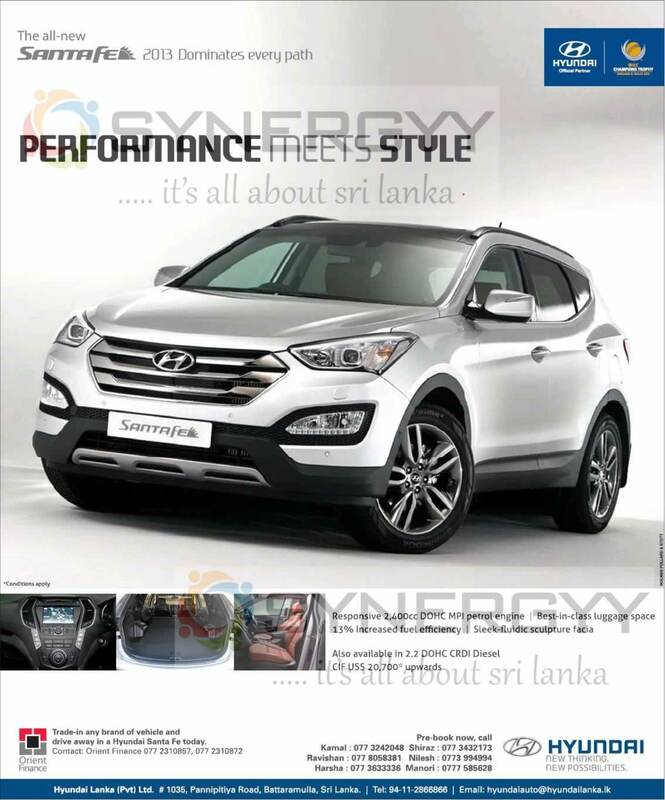 Or visit to Hyundai Lanka (Pvt) Ltd # 1035, Pannlpltiya Road, Battaramulla, Sri Lanka. It’s time to fall in love again with MG6, Take a journey through memory lane with the all new MG6, the modern-day classic, now in Sri Lanka. It’s a love affair that lasted almost a century. 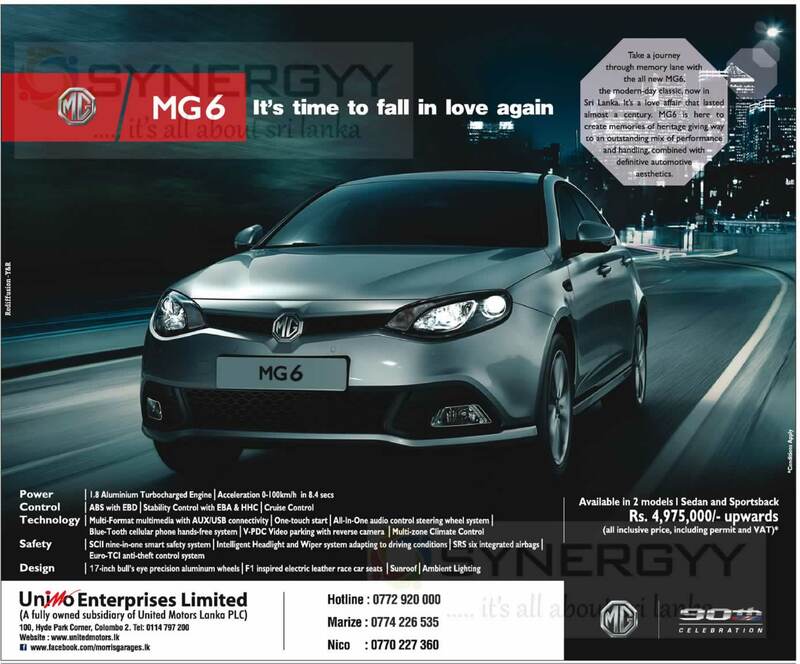 MG6 is here to create memories of heritage giving way to an outstanding mix of performance and handling, combined with a definitive automotive aesthetics. 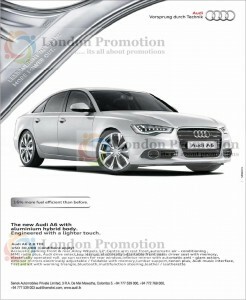 17-inch bull’s eye precision aluminum wheels, F1 inspired electric leather race car seats, Sunroof, Ambient Lighting. 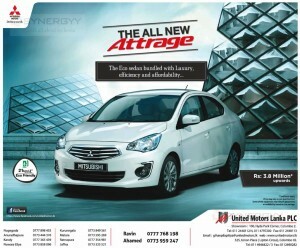 The Eco sedan bundled with Luxury, efficiency and affordability Mitsubishi Attrage now in Srilanka for Rs. 3.8 Million Upwards (38,00,000.00). 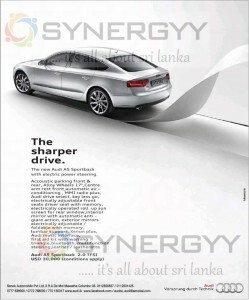 Showroom: 100, Hyde Park Corner, Colombo 2. 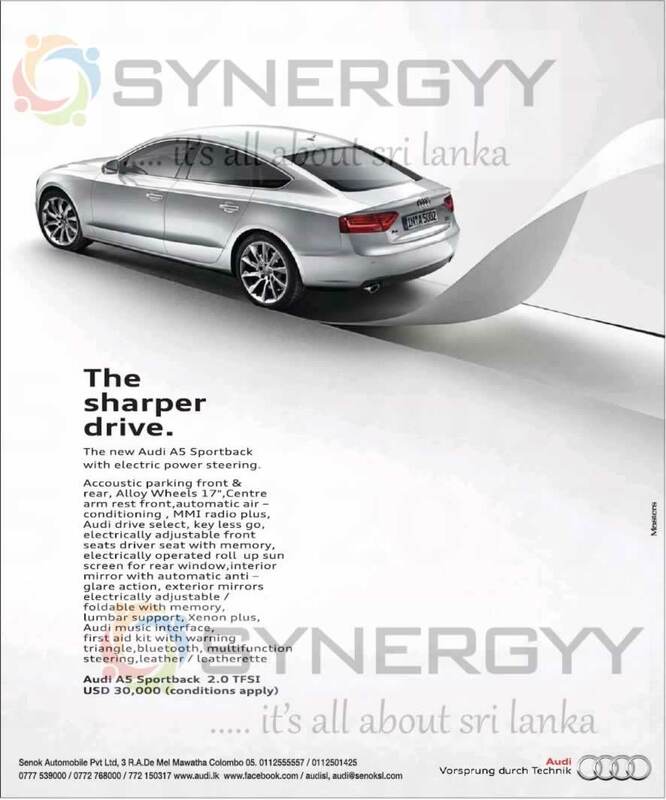 ES EuroSports Auto a partner of the Micro Holdings imports and sells Giulietta Cars in Sri Lanka, Giulietta Cars are renown for the performance along with stylist. 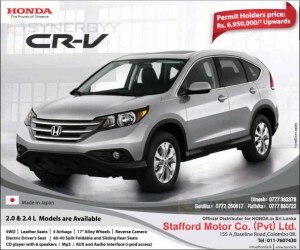 The Stafford Motors Co (Pvt) Ltd offers you the Honda CV Model SUV with 2.0 & 2.4 L for Rs. 6,950,000.00 upwards for permit holders. The Colonial Motors Ceylon Ltd offers you a brand new Mazda3 – 2014 for permit Price of USD 25,000.00. 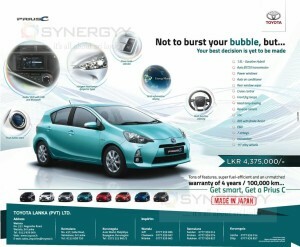 Visit nearest Colonial Motors Ceylon Ltd on 41/35, Nagahamulla Road, Pelawatte, Battaramulla or 297, Union Place. P.O Box 349 Colombo-02. 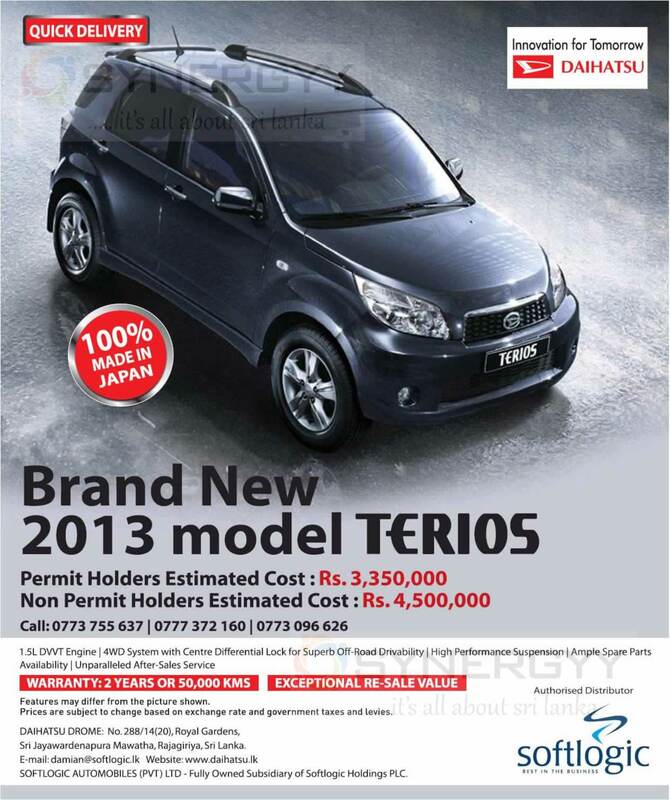 The Softlogic brought you a Daihatsu Terios SUV in Sri Lanka for Rs. 3,350,000 for Permit Holder and Rs. 4,500,000.00 for Non Permit Holders. 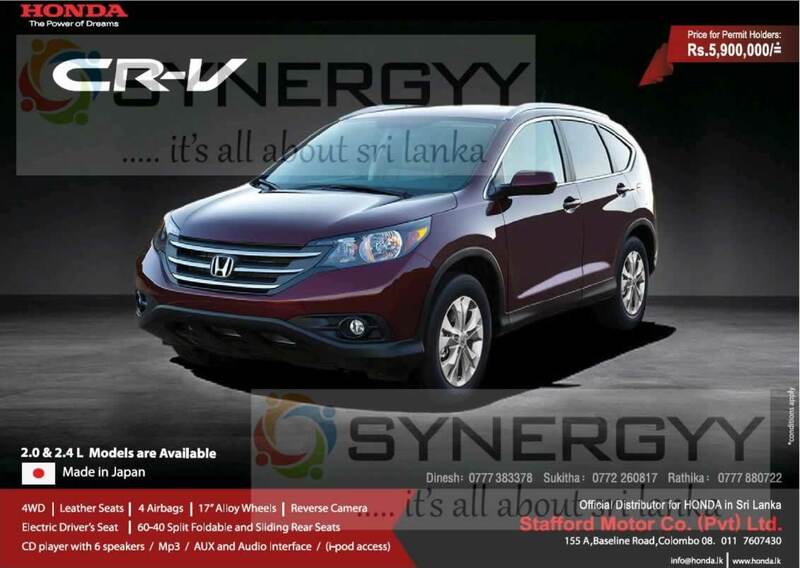 With the unmatched warranty: 2 years or 50,000Kms with Exceptional re-sale value for more information see below image call or Softlogic on 0773755637, 0777372160, 0773096626. 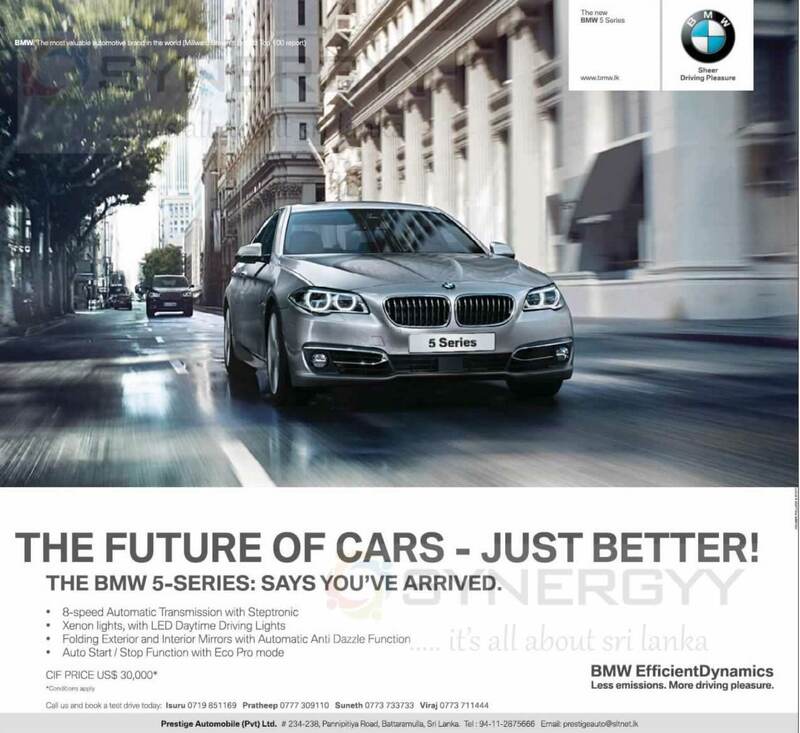 The most waiting the BMW 5-series: Says you’ve arrived; enjoy the unmatched performance of 8-speed automatic transmission with steptronic, Xenon lights, with LED daytime driving lights, folding exterior and interior mirrors with automatic anti dazzle function, auto start/ stop function with eco pro made. 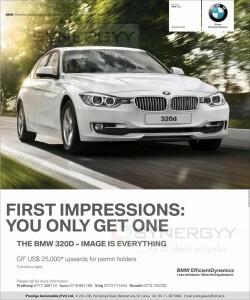 The BMW 5 Series now available for CIF price of US$ 30,000 for permit holders. 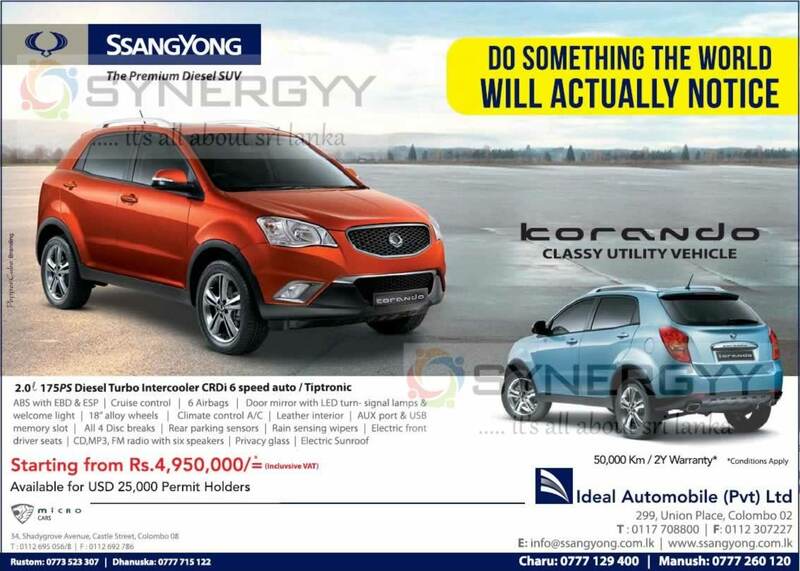 The Micro Cars and Ideal Automobiles dealers of the SSangYong SUVs in Sri Lanka announces the special prices for the Korando as Rs. 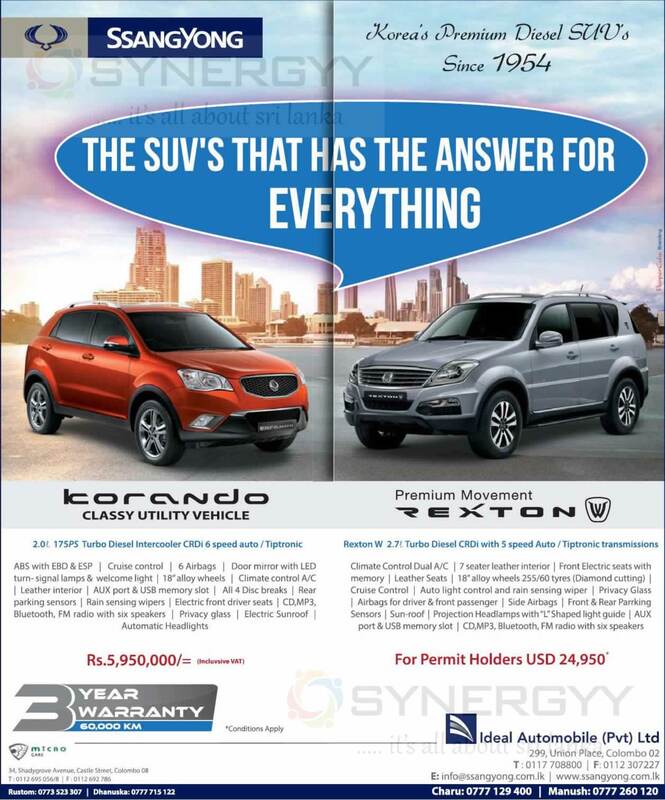 5,950,000.00 ( Inclusive VAT) and SSangYong Rexton for USD 24,950.00 for permit Holders. 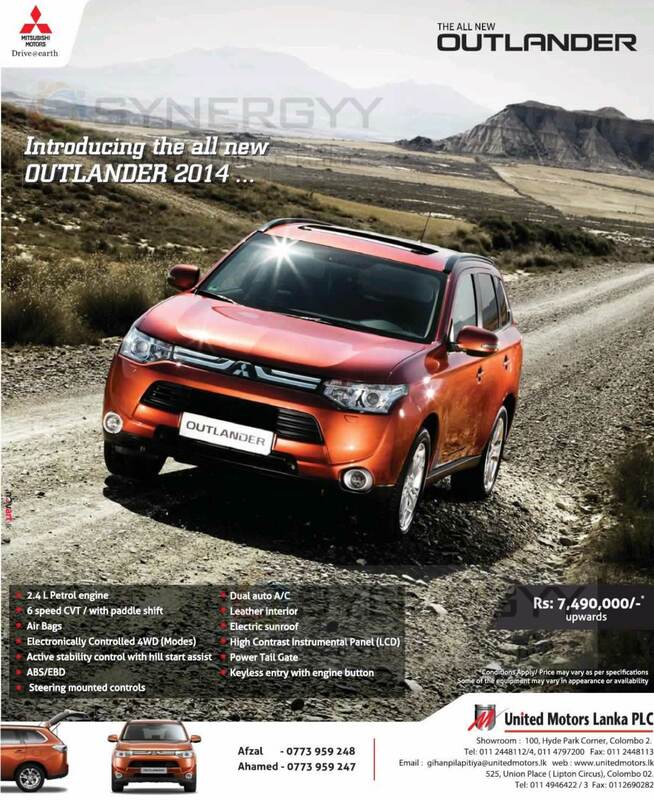 The United Motors Lanka Introducing the all new OUTLANDER 2014.2.2 L petrol engine with 6 speed CVT/with paddle shift along with Air bags, Electrically controlled 4 WD (modes). 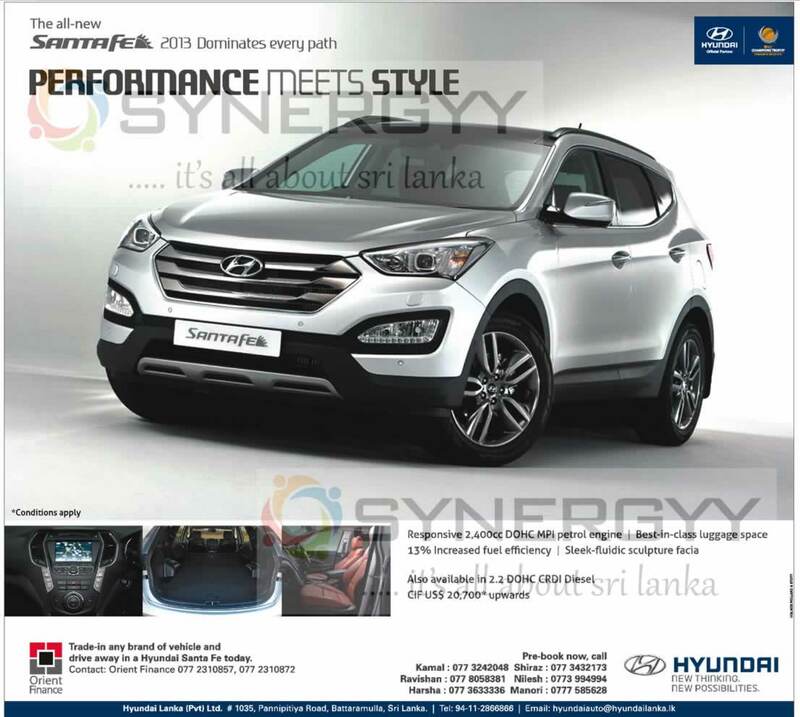 And enjoy the specific features of Active stability control with hill star assist, ABS/EBD, Steeringmuted controls, Dual auto A/C, leather interior, Electric sunroof, High contrast instrumental panel (LCD) , Power Tail gate, keyless entry with engine button. The Mitsubishi Outlander 2014 is available for Rs.7,490,000 upwards. Make weekends fell like weekends. Weekdays shouldn’t have weak ends. 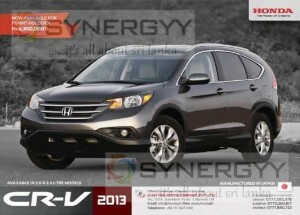 And here’s a compact SUV that feels just the same. 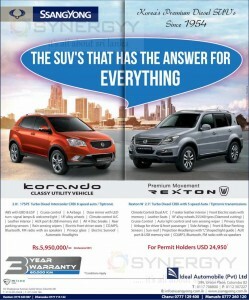 The Mahindra Quanto. It can do everything that a hatchback only dreams of and more. Read on and discover how much more every day of the week can be. 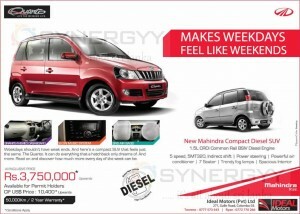 New Mahindra Compact Diesel SUV 1.5 L CRDi Common Rasil BSIV Diesel Engine. 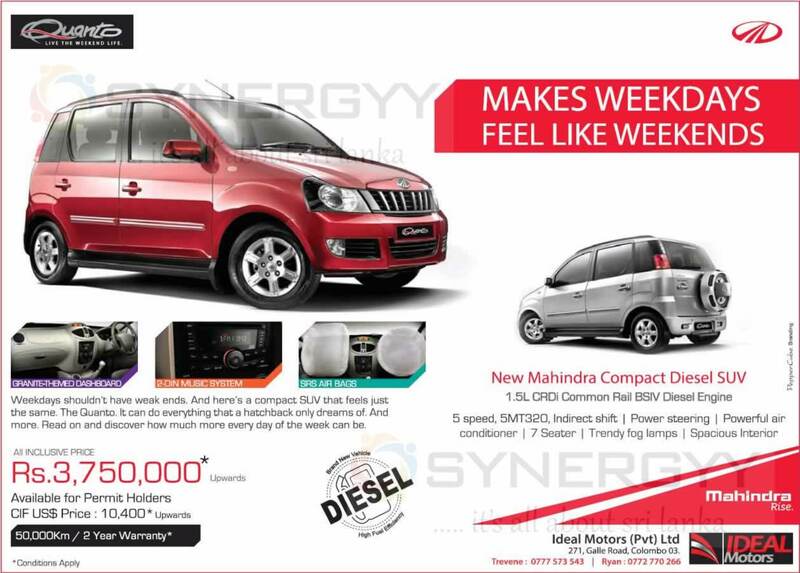 Enjoy the feature of the 5 Speed MT320, indirect shift / power steering/ powerful air conditioner/7 seater/trendy fog lamps/spacious interior. All now inclusive price of Rs. 3,370,000 upwards available for the permit holders. 50,000km/ 2 years warranty. 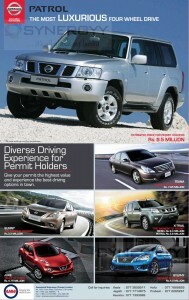 Nissan PATROL Rs. 9.5 million. Some call it Athletic refined and responsive. We just call it alive. 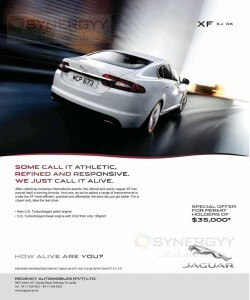 After collecting numerous international awards the refined and sporty JAGUAR XF has proved itself a winning formula. And now as we’ve added a range of improvements to make the XF more efficient, practice and affordable, the best has just got better. For a closer look, take the test drive. 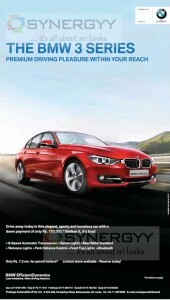 New 2.0L Turbocharged petrol engine or 2.2L Turbocharged diesel engine with CO2 from only 135g/km. It is an positioning to own your desire JAGUAR XF in Sri Lanka own your very own JAGUAR XF with Special offer for your Permit at a best price of $35,000 from Regency Automobile. 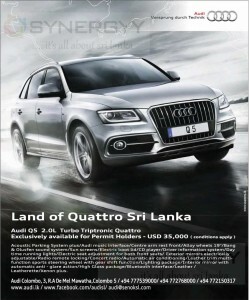 The Audi Colombo exclusively imported the Audi Q5 2.0L Turbo Triptronic Quattro now in Sri Lanka for the Permit Holders for USD 35,000 (conditions apply). 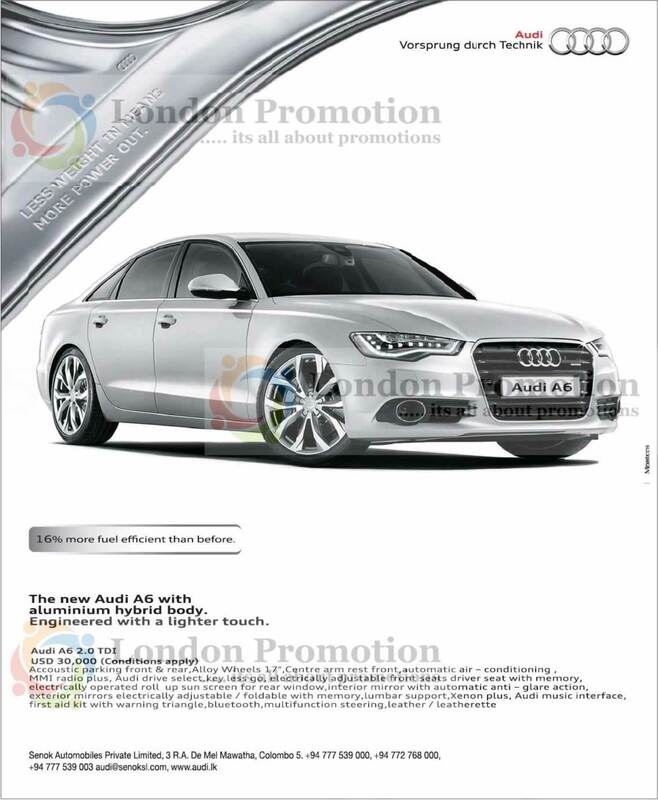 And enjoy the extreme features of Acoustic Parking System plus, Audi music interface, Centre arm rest front, Alloy wheels 19″, Bang & Olusfen sound system, Sun screens, Electric boot Lid, CD player, Driver information system, Day time running lights, Electric seat adjustment for both front seats, Exterior mirrors electrically adjustable, Radio remote Locking, Concert radio, Automatic air conditioning, Leather trim multifunction sports steering wheel with gear shift function, Lighting package, interior mirror with automatic anti – glare action, High Gloss package, Bluetooth interface, Leather, Leatherette and Xenon plus. The Micro and Ideal Automobile announces a special prices for SsangYong Korando as Rs. 4,950,000/= or USD 25,000 for Permit Holders. 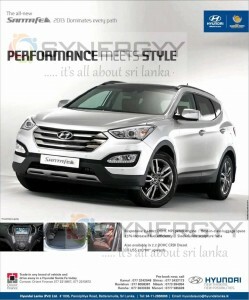 The Hyundai Srilanka introduces the Hyundai Santafe 2013 model to Srilanka for USD 20,700.00 for permit holders. 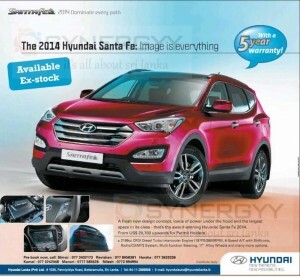 Trade-in any brand of vehicle and drive away In a Hyundai Santa Fe today. Or contact to Orient Finance 077 2310857, 077 2310872 for leasing option. 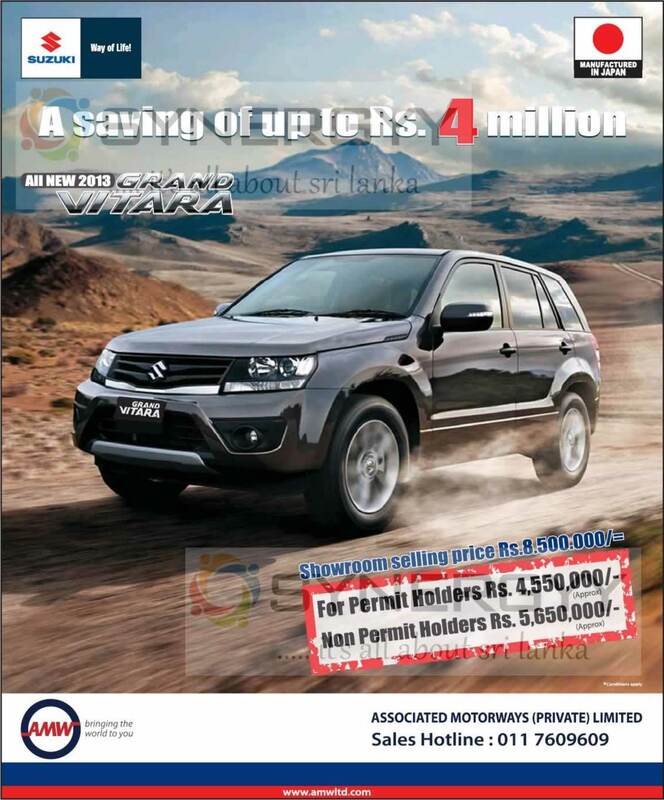 The AMW Srilanka announces the special prices for the Suzuki Grand Vitara for Rs. 4,550,000 for permit Holders and Rs. 5,650,000.00 Non Permit Holders. 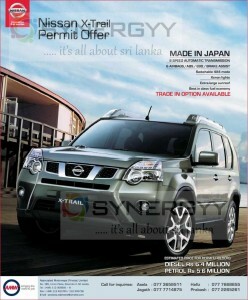 AMW brought you Nissan X-Trail Diesel for Rs. 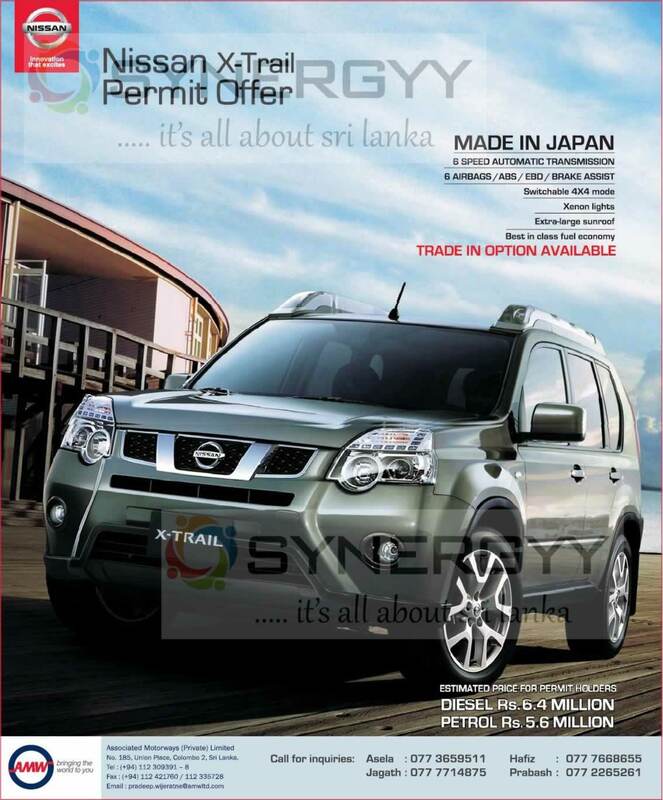 6.4 Million and Nissan X-Trail Petrol 5.6 Million for Permit holders in Sri Lanka. 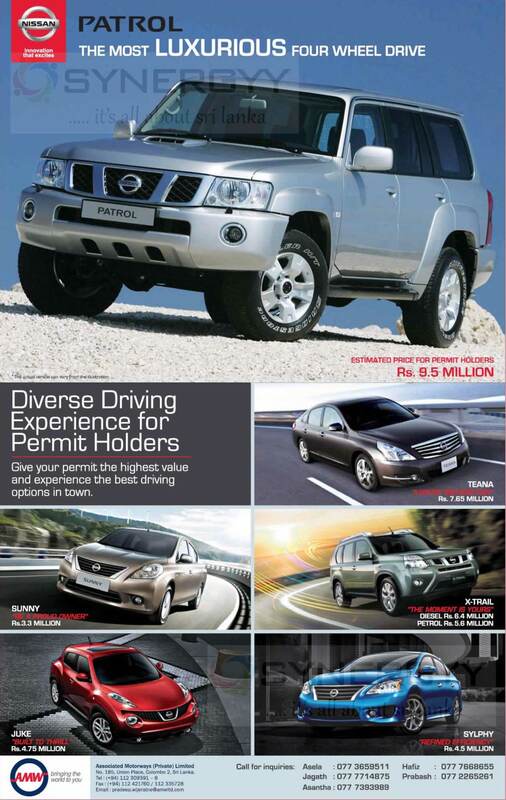 Serok Automobiles Private Limited announces a Special Prices for USD 30,000 for Permit Holders, and enjoy 16% more fuel efficient than before with aluminium hybrid body. Engineered with a lighter touch. For more information contact to Dinesh: 0777383378, Sukitha: 0772 260817,Rathika: 0777880722 or Stafford Motor Co. (Pvt) Ltd, 155 A,Baseline Road,Colombo 08. 011 7607430.
for more information contact Hyundai Lanka (Pvt) Ltd. # 1035, Pannipitiya Road, Battaramulla, Sri Lanka. 3 R.A.De Mel Mawatha Colombo 05. The Stafford Motors announces the special Prices for the CR-V 2013 Honda- The Power of Dreams is for Permit Holders at Rs 6,300,000/= Available in 2.0 and 2.4 Litre models. 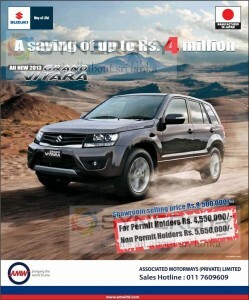 for contact to Stafford Motor Company (Pvt) Ltd.